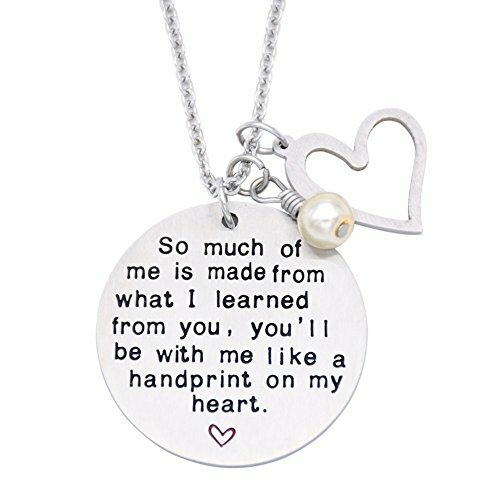 ♥This is a beautiful necklace with 'So much of me is made from what I learned from you, you'll be with me like a handprint on my heart' hand stamped onto a 30mm*30mm stainless steel disk. It comes with 1 white pearl and 1 stainless steel personalized hearts are then added to complete this necklace! Great teacher's gift for Christmas, teacher appreciation or end of the school year! Your teacher will love this necklace and will wear it with pride! Feedback:O.RIYA JEWELRY LTD pays great attentions to the shopping experiences and feedback from the customers.Your satisfaction and positive feedback with 5 stars is the motivation for us to move forward.It would be highly appreciated if you could leave a good review or a positive feedback to our product and our store. If you have any problems with our items or services, please feel free to contact us first before you leave negative feedback. We will do our best to solve any problems and provide you with the best customer services. This is a custom hand made necklace great for a gift for your favorite teacher. "So much of me is made from what I learned from you, you'll be with me like a handprint on my heart." This necklace will make a wonderful gift for a teacher, coach, instructor, professor, for Teacher Appreciation Day, teacher's birthday, a Christmas gift, or a simple "just because" moment. The pendant is stainless steel. It comes with 1 white pearl and 1 stainless steel personalized hearts. If you have any questions about this product by O.RIYA, contact us by completing and submitting the form below. If you are looking for a specif part number, please include it with your message.